→Open Eyes Self Hypnosis-By Reading and Writing Scripts!! Open Eyes Self Hypnosis-By Reading and Writing Scripts!! Open eyes self-hypnosis is an astonishing process I found in Forbes Robbins Blair’s book where we can use self-written scripts to hypnotize ourselves. We all know very well that self hypnosis could be used for various personal development purposes like building confidence, eradicating fears, better health, improving the rapport between conscious and subconscious mind, the possibilities are countless. Often self hypnosis is perceived as something complicated, but actually it is a very simple and already familiar process to us. Self hypnosis is just a way to relax and take the mind into a state where it is open for any suggestion. 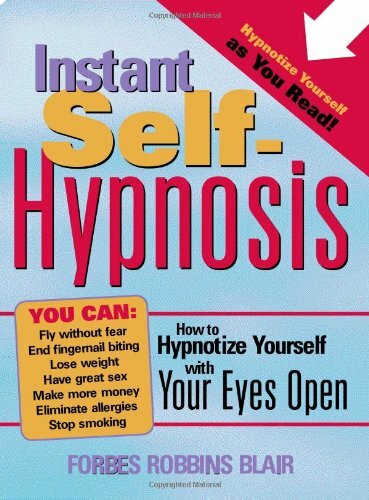 There are many ways to perform self hypnosis, but, here we will ponder upon instant self hypnosis that comes from the book written by Forbes Blair named Instant Self-Hypnosis: How to Hypnotize Yourself with Your Eyes Open. How Instant Self Hypnosis Is Done? Well, according to the author there are basically two steps for performing self hypnosis with eyes open and they are done using self hypnosis scripts that anyone can customize according to their comfort. In the book, the author provides many self hypnosis scripts for the common purposes. The specialty of this method is that we just have to read or write the scripts the way the author has guided for doing self hypnosis. Reading and writing scripts for hypnotizing oneself is not only a new concept but it is pretty interesting as well. The author is a hypnotherapist who found that the mind can go into a trance state while reading scripts, he discovered this amazing method when he was preparing scripts for his clients. The book uses a simple language to make people understand the open eyes self hypnosis method and it also makes them to perform it, the books also says “hypnotize yourself as you read” but do not get excited by that as you won’t be able to know when your mind went to a deeper level while reading the script for the first or second time. Frankly, I was so skeptical and I even thought that I made a wrong decision when I did this for first two days because I was not able to feel any “trance” like state. The author himself has said that a person may not experience something different in the initial days but slowly they will notice the difference. On the third day, I felt as if my consciousness was altered while reading the script and I was happy to know that I made the right decision. However, I was busy with few other practices so I had to drop this on the way, but after a few reads I knew that it was good enough for to be suggested to my readers who are interested in self hypnosis. How Much Effective Instant Self Hypnosis Is? The book suggests to follow a self hypnosis routine with a chosen script for at least two weeks to see some significant results and in my case I started to see its effect within just 5 days, it varies from people to people. This book is especially designed for those who find it hard to close their eyes and sit for meditation or self hypnosis. I suggest you to opt for the program that makes you to use your imagination for giving suggestions to your subconscious mind like Marisa Peer’s Transformational Hypnotherapy but, the book indeed is a good read with some real cool exercises. Thank you so much for reading. I will be very happy to hear from you so, please do leave your comments in the box below.